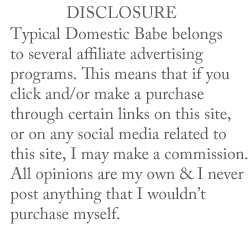 Introducing the new Typical Domestic Babe! It was time that she got a makeover :) Take a few moments, and look around. Tell me what you think - I would love feedback! A new feature that I'm really excited about is the 'Shop' tab that you see at the top of this page. I've actually had quite a few requests for this and I'm stoked to get started! Starting soon, you'll be able to shop my closet and purchase gently used pieces of shoes, handbags, and clothing on the cheap. A portion of each sale will always be donated to my favorite charities.